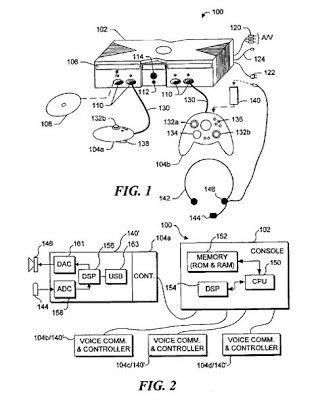 The ‘959 patent describes a game console capable of communicating with other game consoles over a network connection. Players on the consoles have the ability to communicate with each other if they purchase a headphone and microphone set. Players also have the ability to mute others during the game. 1. For use with an electronic game played on at least one multiplayer game console, a method for enabling players to verbally communicate in real-time while playing the game, comprising the steps of: (a) providing an audio sensor for at least one player who is using the multiplayer game console, said audio sensor producing an input signal to the game console in response to sound produced by said at least one player; (b) providing at least one sound transducer that is adapted to produce sound audible to another player of the game in response to an output signal; (c) encoding the input signal from the audio sensor to produce an encoded digital signal; (d) conveying the encoded digital signal through a voice channel associated with said other player; (e) decoding the encoded signal in the channel of the other player, to produce the output signal; and (f) providing the output signal to the sound transducer to produce an audible sound corresponding to the sound produced by said one player, so that a verbal communication by said one player is heard by said other player of the game. Today Google announced a new initiative to try and keep patents out of the hands of patent trolls, entities whose only business is amassing intellectual property and filing lawsuits. 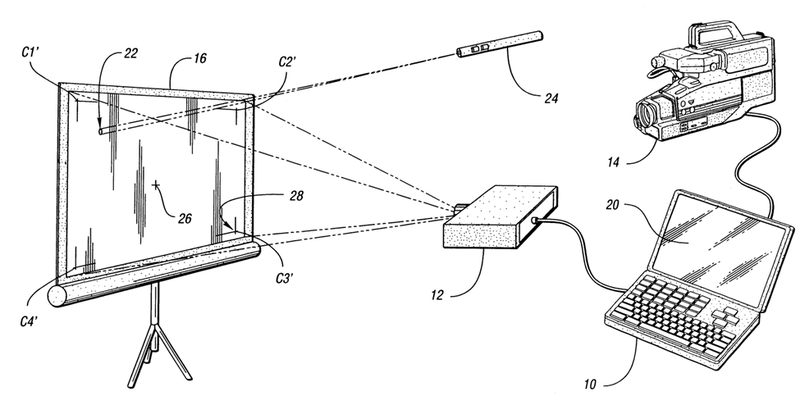 Google is calling this new effort the Patent Purchase Promotion. Google is basically asking patent owners to trust them. The company has pledged in the past to only use its patents defensively, suing only if someone sues it first. Of course, a company’s stance on patents can shift over time as it moves from young disrupters to entrenched incumbents. 2015 could also be the year Congress takes action. Or not, knowing Congress. An experiment indeed. More info over at The Verge. Needless to say, if you are a small entity that has one or two patents and you’re looking for some quick revenue, this may be a good way to go. This is especially true if you want to ensure that your patents don’t end up in the hands of patent trolls non-practicing entities. However, only time will tell how Google uses the patents in the future. The ‘769 patent seeks to help assist healing of the human body after an injury. Each medical condition is stored in the program and will include a work out which will assist healing. Whenever a person selects the ailment affect their body the video game screen will produce information about the illness as well as recommended exercises and activities to assist the body. This invention is intended to facilitate treatment of disease in the person’s body, but it should not be used as a substitute for seeking medical attention. 1. 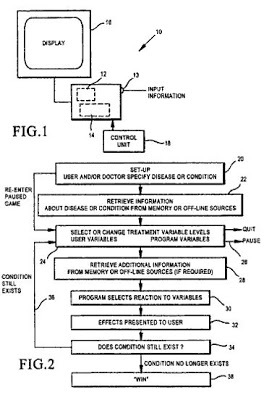 A video game system for treatment of medical conditions of a human player’s body, comprising: a first memory section for storing or receiving information concerning a medical condition to be treated, including the effect of the medical condition on a portion of the player’s body affected by the medical condition; a second memory section for storing or receiving a set of treatment actions for combating said medical condition, to bring healing action to the player’s body; a third memory section for storing or receiving known result/information of the treatment actions on the medical condition; and a stored video program and controller operating with said first, second and third memory sections, for providing a visual representation of the player’s body, including said portion of the player’s body affected by the medical condition; wherein the stored video program and controller permits a player to select one or more treatment actions and provides a visual representation of the effects of the selected treatment actions on the medical condition, in accordance with the known result information, to provide reinforcement of the effect of said selected treatment actions on the medical condition of the player. The ‘414 patent should appeal to any online gamer. The invention allows voice communication control by users. This means that players may selectively block voice communications with another player during current or future games. A player can block the communication by the other player for the short term (by muting him during the current game) or permanently block all communications from him. Anyone who has played online for any length of time knows how out-of-control profanity can be online. This invention should give the player the ability to control what he can hear. 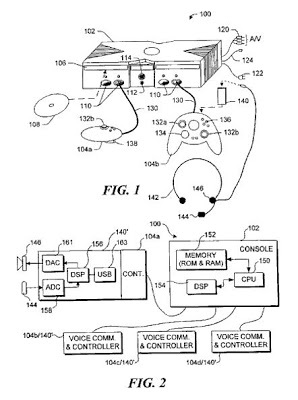 Voice communication between players using one or more multiplayer game console is selectively controlled. A player may selectively block voice communications with another player during a current and any future games. In addition, an authorized party (e.g., a parent) can selectively preclude voice communication by a minor child by setting an option that is uploaded to an online game service service; the minor child is then precluded from voice communication on any voice console via the online game service. Also, a player may be temporarily or permanently banned from voice communication during games played through an online game service in response to complaints made by other players concerning the player’s behavior in voice communication while playing games, e.g., excessive use of profanity. When a player signs on to the online game service, data are downloaded to the game console that indicate any applicable restraints on voice communication. 1. For use with an electronic game played on at least one multiplayer game console having a capability to provide verbal communication between players of games being played on said at least one multiplayer game console, a method for preventing verbal communication by a specific player, comprising the steps of: (a) maintaining data for each player participating in a game; (b) including an indicator in the data, said indicator referencing the specific player who is precluded from verbally communicating during at least one of: (i) a current game session played with another player who has chosen not to verbally communicate with the specific player; (ii) all games played with another player who has chosen not to verbally communicate with the specific player; (iii) all games played by the specific player over a network and using a specific online game service; and (iv) all games played by the specific player using any multiplayer game console; and (c) responding to the indicator in the data by automatically preventing verbal communication with the specific player in accord with said at least one of subparagraphs (i)-(iv) of step (b). Acceleration Bay LLC v. Electronic Arts, Inc.
Fresh off their complaint against Activision Blizzard, Acceleration Bay has filed a new complaint alleging that Electronic Arts is infringing several networking patents in regard to their realm-spanning multiplayer in FIFA 15, NHL 15, Tiger Woods PGA Tour 14, Crysis 3, and Plants vs. Zombies: Garden Warfare. Plaintiff Acceleration Bay accuses Electronic Arts of infringing the same patents as the Activision Blizzard complaint, which was filed three weeks prior on March 11, 2015. The complaint alleges that Electronic Arts uses peer-to-peer networking in their games, e.g., in FIFA’s Pro Club mode, which paragraph 30 of the complaint alleges allows “individual players from different locations to interact and communicate with each other inside FIFA 15’s gaming environment.” As in the Activision Blizzard case, Acceleration Bay will likely have to overcome an argument that the claims are directed to an abstract idea, and will have to show that the peer-to-peer networking alleged to exist in the games matches the specific mathematical models claimed in Acceleration Bay’s patents. The ‘513 patent provides a method for allowing players to connect online to play a chess game. The players can meet other challengers on a website where the network matches them up based on their match records. The goal is to match up players with like skill and ability so that the games can be enjoyable and challenging. The invention also calls for a system where the player can play a computer-controlled player with the feeling of playing a skilled human opponent. In this mode the computer is programmed to make moves based on the likelihood of the moves by the most gifted human players. The computer records the movements made by the highest-ranked players during their matches and mimic these moves to create a harder opponent for the human player who wishes to play the computer rather than another human being. The present invention relates to a game method for allowing simultaneously playing a game of paduck, chess, Korean chess, etc. through the one-line internet in a one-to-many manner. 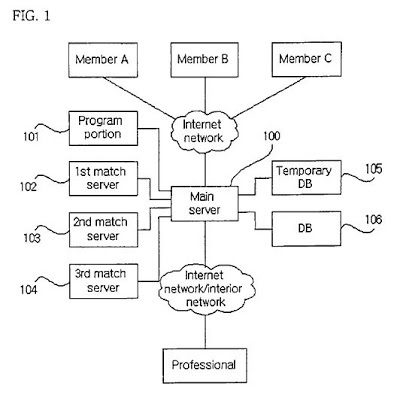 The game method comprises the steps of: connecting by the members with the web site via the internet network, inspecting the member information including their match records and alist of matches, in which the members can participate, provided by the web site, selecting a match, in which the members want to participate, of the list of matches, and connecting with a pertinent match server; when the selected match starts, providing by the match server the members and the professional with the match screen; when the members select and input moves, extracting by the program portion a highest-ranking move which greatest majority of the members select, and searching moves which are selected by the members in a ratio almost equal to that of the highest-ranking move; applying by the match server the highest-ranking move to the match screens of the members and the professional; and when the professional selects a move, applying by the match server the move selected by the professional to the match screens of the members and the professional. 1. In an on-line game providing a plurality of matches, each of said plurality of matches being played in a manner of using a plurality of stones, a game method for allowing to play the game simultaneously between a professional and a plurality of members, said game method comprising: connecting said members to a match server; providing a match screen to each of said members and said professional connected to said match server, respectively; extracting a highest-ranking move which greatest majority of said members select, when each member selects a stone’s move of said plurality of stones; applying said highest-ranking move to said match screen of each of said members and said professional, respectively; and applying said move selected by said professional to said match screen of each of said members and said professional, respectively, when said professional selects a stone’s move of said plurality of stones.